General Manager of Centara Khum Phaya Resort & Spa Chiang Mai Jerome Sim (2nd from left) welcomed H.E. Jeong Hae Moon Secretary General of the ASEAN Center – Korea, in Seoul, the Republic of Korea to the hotel recently. The Secretary – General stayed at the hotel to participate in the ASEAN Tourism Human Resources Development Program in cooperation with the Tourism Authority of Thailand. Soho Bar and Guesthouse owners Shauna and Krathai held a party on Saturday, September 14, 2013 to show support for gays in Russia who are suffering persecution under the regime of President Vladimir Putin and to join the call for the boycott of the Olympics that will be held in Russia at Sochi in 2014. On Sunday, September 15 Russia agreed to alter the wording of the “Olympic Truce” a normally perfunctory statement that invokes the ancient Greeks and celebrates friendly competition and “the cause of peace.” The Russians agreed to alter the wording to say that it would “promote social inclusion without discrimination of any kind”, although Russian laws that appear to be anti-homosexual remain on the books. 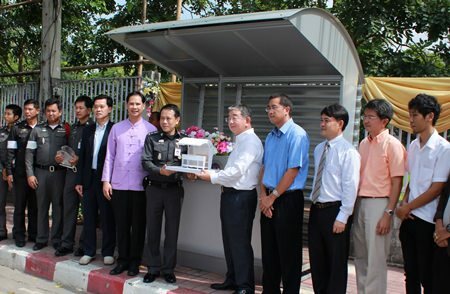 SUS (Thailand) Co., Ltd recently donated two traffic police boxes to the Muang Chiang Mai Traffic Police. The traffic police boxes were a result of the Police Box Design Competition held by SUS (Thailand) Co., Ltd and the Faculty of Architecture, Chiang Mai University. The traffic police boxes were made mainly of aluminum due to its 100% reusable quality, in-keeping with the design competition’s eco-friendly theme. Joining the SUS (Thailand) Co., Ltd’s police boxes donation ceremony were Muang Chiang Mai Traffic Police officers, CMU Faculty, Police Colonel Sitthichai Thananchai, Superintendent Traffic Chiang Mai Province Police, Mr. Yasuo Ishida, SUS Corp Representative Director and President, Asst. Prof. Dr. Tanut Waroonkun, Faculty of Architecture, CMU, SUS team members and Mr. Tanawat Malisuwan, Year 4 student and the winner of the small-sized traffic police box design competition. The team from Compass Magazine paid a visit to Beer Republic on Nimmanhaemin soi 11 on Sunday, September 15, 2013 for the debut of their new Sapporo Beer night. Here Patinya “Joon” Srisuk welcomes the team and joins them for a Sapporo beer. The Ornsirin Group recently celebrated their 6th anniversary where the Executive Chairman Boonlert Buranupakorn announced that the development company had built 21 high quality real estate projects, 6,000 commercial buildings and townhomes in addition to the 9 The Next Condominium by Ornsirin and The Astra condominium on Chang Klan Road. He announced at the press conference held at the RatiLanna Riverside Spa Resort Chiang Mai that the company plans on expanding to Bangkok. The Minister of Industry, Prasert Boonchaisuk opened the “Way to Rich” Fair with Deputy Governor Adisorn Kamnerdsiri, Narinthip Wiriyabandit Chief Executive Officer of People Media Company, Duangkamol Jiambutr Deputy Director General of Department of International Trade Promotion and Director of Provincial Business Banking of Bangkok Bank at Central Plaza Chiang Mai Airport recently. The fair was held by People Media Company, Chee Chong Rouy magazine, Smart SME Channel and Bangkok Bank.